The first Macintosh clone in the world was not one of the Apple sanctioned systems released in 1995, such as those from companies like PowerComputing, Radius, Umax or Daystar Digital. Nor was it the Outbound laptop in 1989, a hybrid system produced using Mac ROMs taken from working Mac Plus systems. No, the first Macintosh clone was the Unitron Mac 512, a unauthorized copy of the 512k “Fat Mac” produced by a Brazilian company in 1986. And it was a pretty darn impressive copy. The fallout from that effort nearly help start a trade war between Brazil and the United States; to prevent theft of Intellectual Property, Apple and other companies lobbied Congress to hike import taxes on Brazilian goods like oranges and shoes as a response. It’s not a widely known story. Pieces of this long-forgotten chapter in Mac history can be found scattered on websites around the world. Here is the fascinating tale of the first Macintosh clone in the world. During the 1980s Brazil was under military rule, and had a reserved market policy for computer sales: only machines produced locally by Brazilian companies were allowed to be sold in Brazil. The importation of mini- and micro-computers was illegal, they were considered to be potential security risks. As a consequence the country developed a local marketplace of clones of the popular computers of the day: MS-DOS PCs, TRS-80, Apple II, and Timex Sinclair. These clones were typically produced without the permission of the brand owners (a situation not unique to Brazil). Unitron was already producing an Apple II clone. 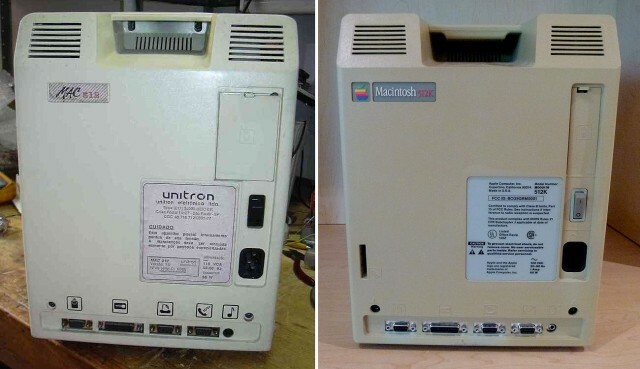 Since it was illegal to import the Macintosh and its proprietary design, Unitron sensed a market opportunity and decided to create a clone of Apple’s 512k “Fat Mac”. The initial plan was to negotiate a licensing agreement with Apple, but the Mothership in Cupertino refused to do this without owning at least 51% of the venture. This kind of arrangement was prohibited under Brazilian law, so instead – with the government’s assistance – Unitron decided to forge ahead without Apple’s blessing. Their Apple II clone was already being sold without any objection from Apple, so this seemed a realistic option to persue. As it turned out, Apple was not as tolerant about their second child. Unitron’s goal was to clone the Macintosh 512k. Many of the components were commercially available, such as the Motorola 68000 microprocessor, RAM chips, analog electronics, etc., but because of Brazil’s restrictive import laws obtaining them could be difficult. 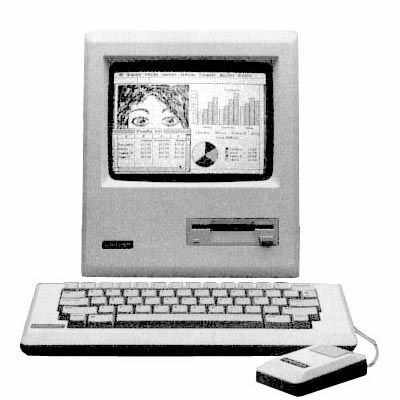 The Mac also contained several custom-design Apple chips: the “Integrated Woz Machine” floppy disk controller, a real time clock chip, and 4 Programmable Logic Arrays (PLAs). These all needed to be replicated. 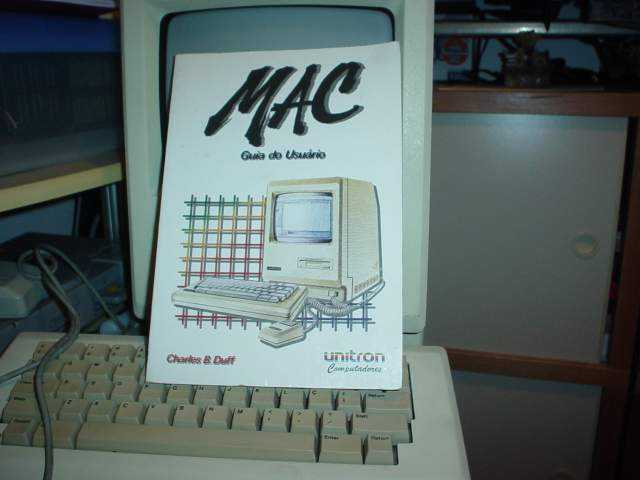 On the software side, Unitron needed to reverse engineer the Macintosh ROM, which contained the Mac Toolbox routines, and localize the Operating System for the Brazilian market and its Portuguese speaking population. The machines were suspended over a small artificial lake in order to keep the public at a distance. de Assumpcao Jr. noted that marketing tricks like these were a popular way for companies to test public reaction to future products. Unitron was able to secure a $10 million loan from the Brazilian government. With the help of several local university laboratories as well as chipmaker National Semiconductor, the group painstakingly reverse engineered the Macintosh ROM and created their own custom chips. The code was written in a mixture of C and 68k assembly language, based on specifications from the Inside Macintosh books. Unitron faced obstacles at every turn. After obtaining their loan, the government was refusing to let them import 3.5 inch floppy disk drives and instead wanted them to adopt locally made 5.25 inch mechanisms instead. 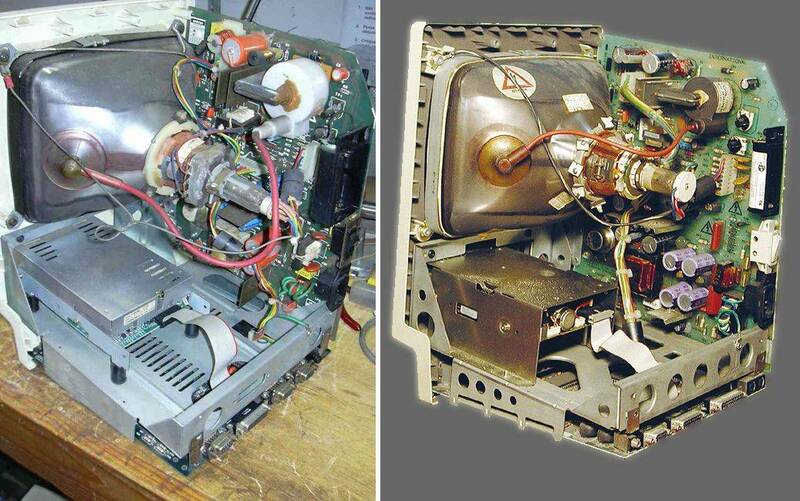 Unitron did wind up using 3.5″ mechanisms (which look like those in generic PC clones) but had to build their own floppy drive factory in order to do so. Unitron also translated the operating system software into Portuguese, and the machine was released to the public later that year. Unsurprisingly Apple’s curiosity was piqued, and they obtained a few machines. After disassembly Apple quickly disputed the fact that the ROM had been reverse engineered. They claimed instead that only a few bytes had been changed to change the checksum, but that the majority of the ROM had been copied. Unitron disputed that claim. Some at the company thought that perhaps the machines Apple obtained for analysis were actually prototypes fitted with copies of Apple ROMs for compatibility testing, rather than production models. Whatever the situation, Apple was not happy with what they saw. To them copying the ROM was theft of Intellectual Property, and they were willing to take action to prevent that. This kind of practice was not a problem specific to Apple Computer. In 1987 they joined with several other technology companies, including IBM and Microsoft, to lobby the U.S. Congress to approve a resolution imposing trade sanctions on Brazilian products if their government continued current practices. Profitable products in major industries such as shoes, textiles, orange juice, and steel would be targeted. “Some articles claimed that they had used a government run lab (CTI in Campinas) to crack open Apple’s chips to look at them under a microscope in order to copy them – “your tax money is being used to help commit a crime!”. Ultimately the potential economic impact to Brazil decided the argument. The government took action to uphold software copyrights and pressured Unitron into canceling the Mac 512 project after over 500 machines had been produced. The company took a serious financial hit and downsized to focus on industrial electronic equipment, as well as the dwindling market for Apple II clones. The Mac 512 designs were subsequently sold to a Taiwanese company – and Apple’s lawyers shut down those efforts as well. The story of the first Macintosh clone had come to an end. Many people felt that Apple’s decision not to license the Mac System Software in the 1980s and early 90s was a mistake. 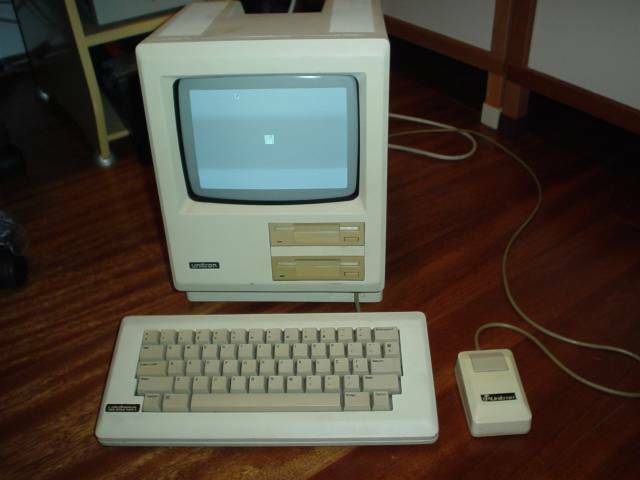 The forcible end of the Unitron Mac 512 left the Brazilian market wide open for PC clones, which didn’t have the same manufacturing restrictions. In 1992 when the law was finally changed and Apple was allowed to sell in Brazil, virtually no one was familiar with the Macintosh. For a short time starting in 1994, Apple finally decided to license the Mac OS to third party clone manufacturers. These systems were based on Apple supplied motherboards, and some of the clones were better performers than Apple’s own offerings. PowerComputing was the most successful of the lot, which also included Motorola, Radius and Umax. But rather than expanding the overall Mac market, the clones began to take system sales away from Apple’s own high end offerings. Steve Jobs killed the clones when he returned to the company in 1997, buying PowerComputing outright to stop the sales cannibalization. Apple has not licensed the Mac OS nor allowed any companies to manufacture Apple compatible hardware ever since.